Brita is the leader of the vigilance committee of Carne Village and a former iron ranked adventurer whose hard-earned healing potion was broken by Momon, but was compensated with a new but unknown one which saved her life. Around 20 years old or younger, she has untidy red hair trimmed short for easy movement. Although her features aren’t bad and her eyes are sharp, she doesn't wear makeup and her skin is wheat colored after long exposure to the sun. 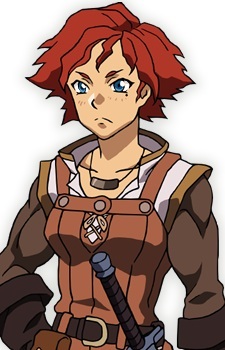 Her arms have solid muscles and her hands are full of calluses from wielding a sword. Brita quits being an adventurer after seeing Shalltear slaughter her teammates. She lost her will to continue as an adventurer and choose another path for her new life. She is currently living in Carne Village as the leader of the vigilance committee. In the web novel version, she obtained the potion differently by sharing the same room with Momonga who did not like the smell from herb she used to cure wounds, so he gave her a potion.